The UT Estate Office has simplified the issuing of the no-objection certificate (NOC). In an investor-friendly decision, the Estate Office (EO) will now issue NOC irrespective of the violations of the building bylaws and the misuse of the premises. The new decision has already been implemented. The Lucknow-Chandigarh Sadhbhawana Express train was delayed by about two hours when the engine locomotive of the train developed a technical fault between Ghaggar and Dappar stations. The ongoing FIFA World Cup has given a great opportunity to business houses, corporate establishments, and small and big traders to cash in on the mania that is likely to continue during the month-long tournament. Extensive media coverage during the buildup to the World Cup has generated a lot of interest in both young and the old apart from business establishments here. Let alone multinational companies, even small traders here have introduced schemes linking their sales with the tournament. 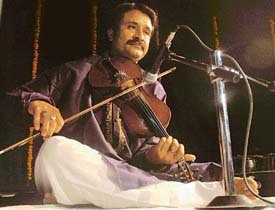 The innate glory of the traditional purity and historical continuity of Indian classical music was brought alive by the young maestro, Dr Santosh Kumar Nahar, in his violin recital organised by the Chandigarh Sangeet Natak Akademy at its auditorium here today. Born with a musical vein, Dr Santosh Kumar Nahar never quite charted the course for his sensibilities. One of the three musically inclined sons of the celebrated vocalist Prof Prahlad Prasad of Mishra gharana (Banaras), he took off on a plane no one had ever expected or imagined. A stand-off between the Electricity Department and the Chandigarh Municipal Corporation over the laying of underground electricity cables is delaying the development works in the bridge market and adjoining areas in Sector 17-C. The Chandigarh Administration will organise an awareness camp at Palsora on June 12 to create awareness about various welfare schemes for the weaker sections of society. The Zila Sainik Welfare Office, Chandigarh, has launched various welfare schemes for ex-servicemen/widows and their dependents who are residents of the city during the year 2006-2007. A delegation of the Federation of Sector Welfare Associations (FOSWAC) today met the UT Chief Engineer, Mr V.K. Bhardwaj, to discuss problems of various sectors. Parks have become a bone of contention between the Municipal Council and the Punjab Urban Planning and Development Authority (PUDA), with the former finding faults with the amenities being provided there and the latter accusing the council of coining “excuses” to avoid a takeover of the parks for maintenance. Up in arms against the allotment of 1700 acres to the Reliance group in Gurgaon, and petrol and diesel price hike, the Indian National Lok Dal (INLD) will hold a protest outside the officer of the Deputy Commissioner on Monday. With just Rs 800 in his pocket, this 35-year-old lean fellow from West Bengal Bidyut Kumar Sardar, took to the arduous task of riding bicycle throughout the country. His noble mission is to spread the message of peace, importance of education and health. 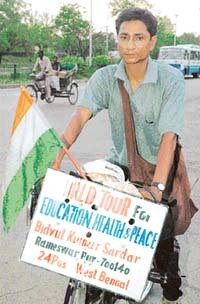 Reaching Chandigarh, after covering a distance of around 7,600 km by pedalling a six-geared bicycle from Kolkata, Bidyut shared his experience with The Tribune, “I started my journey on bicycle to embark on the noble mission from my native Rameshwar Pur village in Mahesthtal, a south district of West Bengal, on February 8 last. A meeting of Punjabi writers was held here yesterday under the chairmanship of Prof A.S. Kaang, a senior professor of Kurukshetra University, Kurukshetra. 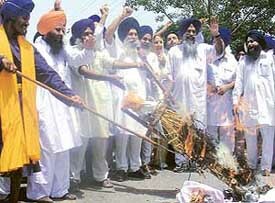 Infamous for harassing general public, the Punjab Police seems to have lived up its reputation yet again. The Shri Yog Vedant Sewa Samiti has started the enrolment of devotees and disciples for offering services during the three-day satsang of Sant Asa Ram starting from June 16 at Seonk village. Local leaders and workers of the Akali Dal held a protest outside the office of the Deputy Commissioner against the hike in prices of petrol and diesel here today. 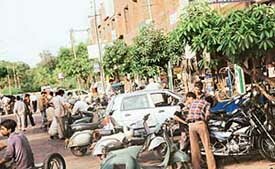 Two persons were injured, one of them seriously, when a group allegedly attacked them in the Phase VII market here today. 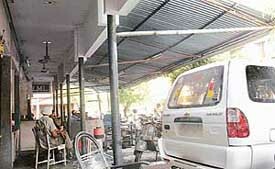 The miscreants also reportedly took away Rs 5 lakh from the office of a property consultant. The body of an unidentified man, aged about 45 years, was found adjacent to a showroom in Sector 5 here today. After a tiff between rival clients of two advocates, a client of a Panchkula-based advocate slapped another advocate from Chandigarh here this afternoon. The Discovery Channel today announced its second collaboration with Nokia with the launch of the Mobile FilmMakers 2006 Awards. In a noble gesture, a Panchkula-based hotel Pallavi has decided to distribute complementary food coupons (worth Rs 100 each) to meritorious students of Panchkula, Chandigarh and Mohali. 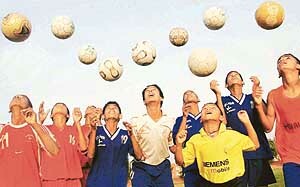 Children are having a gala time by participating in various activities like dance, aerobics, art and craft, yoga, conversation skill and modelling offered at a unique summer camp “Mercury” organised by Education Tower. A ceremony to honour successful students of the Canadian Institute for International Studies (CIIS) was held at the institute in Mohali today. 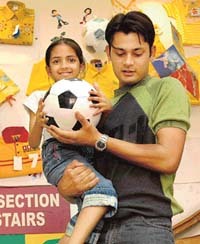 The students were part of the first batch in Computer Graphics Design and Live in Care Giver (LICG) programme. Students of Rainbow International School, Sector 27, celebrated the closing of summer camp with a great enthusiasm here today. The participants took part in a dance performance besides beating the heat by splashing in the swimming pool. 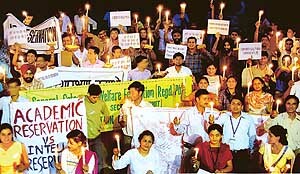 The PGI Resident Doctors Association revived the anti-quota protest in the city today by organising a massive candle light procession, which was attended by 2000 medicos from all over the city. HelpAge India organised an eye check-up camp at the Ram Darbar dispensary here today. A team of HelpAge India doctors examined 200 patients. Twentyfive persons were operated upon for cataract free of cost. The Department of Medical Microbiology, PGI will organise a six-day national workshop under the Centre for Advanced Research in Medical Mycology from June 12 to 17. The Tennisball Cricket Association of Chandigarh has selected 22 probables for a coaching camp in preparation for Chandigarh’s participation in the 14th Junior National Tennisball Cricket Championship to be held at Roorkee (Uttaranchal) from June 26 to 29. The Panchkula District Cricket Association affiliated to the Haryana Cricket Association is conducting trials to select fast bowlers in the below 15, below 17 and below 19 age groups. The trials will be held tomorrow at 9 am at J.R. Institute of Cricket Technology, Naggal village, near Barwala. To upgrade the level of their players and local coaches, Amateur Baseball Federation of India (ABFI) is planning to conduct more coaching clinics and invite foreign coaches to impart training to local coaches. Bhavna Sharma of AG Haryana lifted the Women’s singles trophy by defeating K. Durga of AG Karnataka in the All India Inter Zonal Audit and Accounts Department Badminton Championship, which is being played at the Indoor Badminton Hall of Sports Complex, Sector 42, here. The ICC team will visit the Punjab Cricket Association Stadium tomorrow to have first-hand information regarding the arrangements being made for hosting the matches of forthcoming ICC Champions Trophy in October. Harmeet Singh and Pankaj in the men’s singles while Sheshna and Ganeer in the women’s singles reached in the finals of under 12 category in the Tricity Lawn Tennis Championship being held at tennis courts, State Institute of Health & Family Welfare, Phase 6, here today.